There are very few opportunities in the current beer scene to be smacked in the face by something GOOD and NEW. Some breweries seem to go into an alley behind a row of restaurants and grab scraps from the garbage to use in their "unique new brew." As Dennis Leary so brilliantly indicated, "Wake the $&*# up and smell the maple nut crunch," Watermelon and pizza do not belong in beer. (Watermelon Wheat is by 21st Amendment- usually a damn good brewery, and the pizza beer is by some slack-jaw named Tom Seefurth). I was fed up with beers claiming to have exotic ingredients flavoring their brew, and further claiming that they tasted good. SO, I was naturally hesitant when I heard that Sam Calagione (fellow Muhlenberg grad) at Dogfish Head was joining with two other spectacular breweries - Victory here in Downingtown and Stone in Escondido, CA- to create a unique herb-flavored ale, but I trusted them. Damn were they right on the money. So, the beer is a saison, which is a pale ale recipe from France. 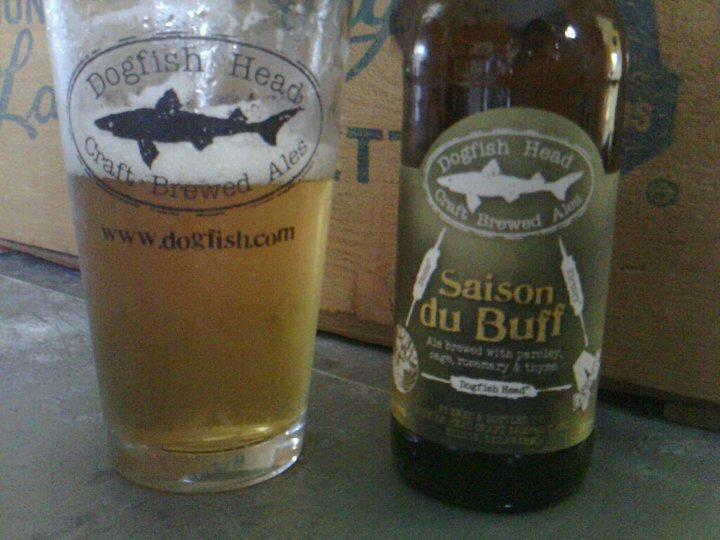 Traditionally, saison was brewed seasonally in the fall and spring, hence the name saison- french for season. The flavor of a saison is very very mild, and thus is a fantastic vehicle for loading on big flavors, and these man did exactly that. The saison is brewed with parsley, thyme, sage and rosemary. The beer, upon first sip, has the very familiar taste of a pilsner or lighter pale ale. But then the herbs come through- you get hit with sage and thyme first, but they do change interestingly into parsley, and finally into rosemary. The herby flavor is not overpowering, but definitely present. There are also notes of orange and an ever-so-slight sweetness. We tried it on its own, and they later with a few different foods, including asian flavored pork belly and filet mignon. It was good on its own, but great with food. At $3.99/bottle, I suggest that you by it by the bottle or 4-pack if you want to try it. I will, however, be going back for more. Enjoy. I'm not a big fan of parsley flavor - and sometimes herbs in general are a little bit much for me. But that beer really was good!